September 30th this voyage started motoring up the Rhine, 146 km in 4 days to Koblenz. October 4th – 12th followed the Mosel, 374 km with 27 locks. As the channel through the Vosges was closed due to lack of water, we had to go west to Vitry-le-François and then the Canal entre Champagne et Bourgogne to the Saône, 360km with 198 locks in 13 days + 10 days repairs in Saint-Dizier. November 5th – 8th we went down the Saône to Lyon, 236 km with 7 locks in 4 days, then 10 days the Rhône to Port Napoleon, 322,2 km with 13 locks in 7 days. After setting the mast and some repairs we started in the Mediterranean November 19th to Menorca. The Wind was increasing to Bft 7 and 10 Miles before Mahon we got problems with our forestay, took the sails down and started the motor. When the motor stopped after 1 hour, I called the rescue, who took us into the harbour. The diesel had clumped and stuck in the tank, we had to saw the cockpit to open, clean and seal the tank. More repairs were necessary as the wooden roof over the cockpit had broken and was replaced by a metal frame with cloth. 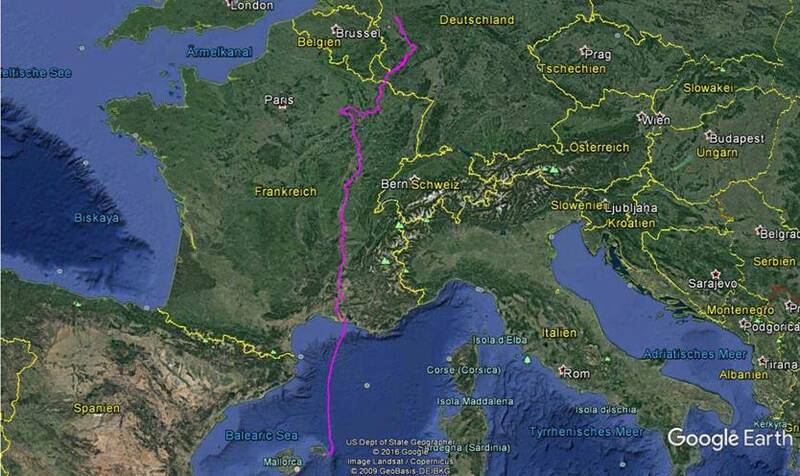 Neuss – Port Napoleon: 1438 km in 36 days with 245 locks + Port Napoleon – Menorca: 238 nm (9,7 with motor), 52 h in 3 days. December 19th we started from Menorca to Ibiza (few wind, 44h, 111sm trying to sail + 11h, 52sm with motor), then to Alicante (26h, 40sm sailing + 14h, 68sm with motor). On Christmas, 2 sailors who came with me from Menorca, returned home, but as the (not often blowing) easterly wind made this possible, I continued alone on December 25th, nonstop to Gibraltar (77h, 276sm sailing + 10h, 39sm with motor). It was a beautiful experience, I felt comfortable, all well prepared with AIS and Radar, arriving in this large harbour at night. While waiting at Gibraltar for favourable winds to the Canaries, I explored the Spanish cities Malaga, Granada, Sevilla and Cadiz by rental car and found a French-Spanish couple who wanted to sail with me to Tenerife. Menorca – Gibraltar: 586 nm (159 with motor, 314 alone), December 19th – 28th 2015. 2016, January 12th we started, motoring west and then sailing to Rabat, Morocco’s capital. On our 4th day Dolphins were swimming with us a longer time. We liked Rabat, but as again easterly winds were predicted, we continued on 17th but the wind ceased soon, the evening of 19th the sea was flat as a mirror! The next day we had wind against our course and as my guests had to return home, we changed our course the 22nd to Agadir. January 27th I continued alone, heading to Tenerife. The next day I heard a German sailor-radio with a bad weather forecast, so I went to Graciosa for 2 days. My antenna didn’t work as I expected, so I sailed to Las Palmas, where an experienced radio-amateur instructed me how to improve my radio with a special antenna and a better ground. In this large harbour I found an Italian couple who wanted to cross the Atlantic with me. I also enjoyed some days of Carnival and used my paraglider for some flights. February 8th we started to Tenerife, my guests became seasick when we had to motor the first hours against wind and waves. We arrived at Los Gigantes the next evening. I had to wait for some parts to arrive there, got a car for a weekend and climbed the Teide for a beautiful sunrise. February 17th we continued, first to Los Christianos, where I had to correct my reef, then to the Cabo Verde Islands. The next days the wind was increasing, so we went one day 4 knots without sails and the next 5 knots just with the small fock. After 8 days we arrived at Mindelo, where we had to repair the genua and the starter. I enjoyed a day at Sant Antão with a walk form Cova do Paúl to Chã de João Vaz. We met some sailors who were also preparing to cross the Atlantic. March 3rd we started to Fogo, where I climbed the impressive volcano the 6th. The evening of March 6th we started at Fogo to cross the Atlantic. The next day we made 140 nm! The 3rd day our forestay, which had been repaired again at Mindelo, got loose and I was lucky to get it fixed again after one hour of difficult and dangerous work. I had to climb several meters to the mast to get the genua down as the roler was broken and without the help of my guests it would have been impossible. As the wind ceased we became slower until the 16th (69nm), but from the 18th on we made every day more than 100 nm. The 18th Toccata, a Warrham-Catamaran which we knew from Mindelo, joined us and we exchanged some food in the mid of the Atlantic (as this boat is longer, they were faster and made the crossing in 17 days). March 27th we were happy to arrive at Barbados. As I had a Clavichord (the Keyboard of the 18th century) on board, I played every day some Bach or Beethoven etc. and as th the solar panels provided enough electricity, I had no problems to cut all the videos of the year before on my computer. I’m allergic to wheat, so I had enough spelt with me, a mill and a baking machine, and made my own bread. My guests also liked to make music, we cooked for each other and we enjoyed to bath at the ladder or with a rope every day. At Barbados we enjoyed to see some sailors from Mindelo again, but I wasn’t able to get the necessary repairs done, so I sailed after 12 days (which I used for excursions on my folding bike) alone to St Lucia, where I got help at Rodney Bay. One hour after my arrival on April 9th, the boats of the World-ARC completed their circumnavigation and had a big feast. 4 of my sails got repairs, the rudder-transmission, roller, starter and dinghy were fixed. At the weekends I hired a motorbike and explored the beautiful Island. I met Michi, a Viennese whom we had seen at Mindelo, and he sailed with me until Jamaica. We craned the boat and cleaned it, after that it was 1 knot faster. The 2nd weekend I climbed the steep Petit Piton with a local from Soufrière. Descending I lost my balance at one of the fixed ropes and injured my back – nothing was broken but I felt it one month. April 19th we sailed south to St Vincent and anchored in a bay where the week before another yacht had been attacked (as we heard the next day). The 20th we were at Kingstown and sailing to Port Elizabeth at Bequila, where we had an evening with a good band. The 21st we sailed along Mustique, Canouan and Mayreau to Union Island. April 22nd – 25th we sailed in 74 h quite fast the 428 nm to Bonaire. 27th we anchored at Little Bonaire, snorkeled and arrived in the evening at Little Curacao. Next morning the historical swing bridge at Willemsstad was opened for us and we got a safe place at Curacao Marine. April 30th my daughter Elli arrived at the airport. After visiting some nature parks and climbing Mt St Christoffel, we sailed May 3rd – 8th the 604 nm to Jamaica. We got a place at Royal Jamaica Yacht club, rented a car, went to the Blue Mountain Peak, the east coast to Reach Falls, Port Antonio, then to Spanish Town, made a canoe tour at Alligator Hole, and the Milk River Bath cured my back. May 16th – 21st we sailed with strong easterly winds to Shelter Bay near Colon, Panama. May 22nd we motored to Linton Bay where we found a cheaper place to leave the boat, as we were going by plane to Peru for 3 weeks. June 17th we motored back the 32 nm to Colon. The 18th our boat was measured by the channel authorities, we had to pay 1875 $ by cash and got the information that our passage would be on 24th. So we had 5 days to find 3 linehandlers, which was difficult without paying more. The 24th we had problems to start our motor and collided with a large ship, but in the evening our pilot helped us and we could start. For the big locks we were tied to One Love, another yacht, so it was easier than expected. The harbours were expensive, so we anchored at La Playita, where we needed some days for repairs. 26th was a great feast for the opening of the new larger lock. After getting a Zarpe for Galapagos we started July 5th, reaching Espiritu Santo at Las Perlas Islands on the 6th. 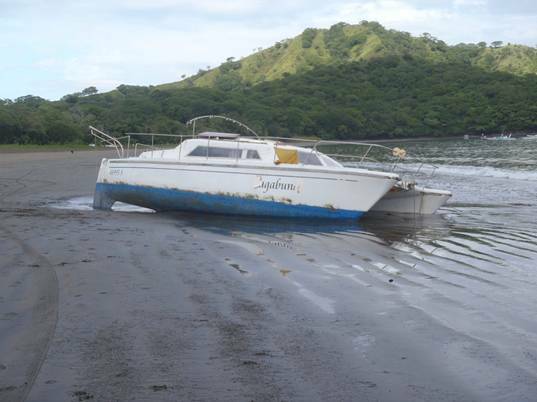 Next morning I used the low tide to clean the bottom, we motored through the islands and continued sailing. After 2 days the wind changed to WSW, we had rain for some days, couldn’t maintain our course and the motor didn’t start any more. We tried to reach Ecuador, but could sail only to Buenaventura in Columbia. We anchored there 4 days and after some repairs (the tank had to be emptied again as the diesel was one problem) we could continue the 19th. Again the wind came from the direction we would have liked to sail. After another 10 days without success we gave up and set course to Costa Rica and reached Puntarenas on August 10th. I decided to wait several months for better weather and looked for a cheap place to leave my boat at land. As the marinas were expensive, had no long term place (Visas are maximum 3 months) and a German diver showed me a cheap place at Playas del Coco, we sailed there. He had shown me a heavy trailer which he used, but when I arrived, the locals who had promised to make a construction to load my catamaran on it, had disappeared due to a struggle. 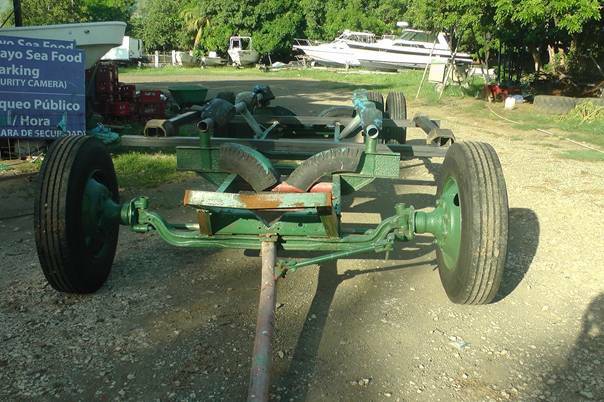 So I got some parts with the owner of the trailer and they were mounted (see photo). Before high tide we put the boat on the trailer, but the supports were too weak, bent down and with the high tide we went back to the anchorage without a problem. Next day (Friday, August 25th) we tried with a wooden construction of tree-stems. But they broke and after about half an hour waiting for the high tide, I was inside and saw water in the bilge. I pumped, but it was still rising and we were not able to get it out with more people, filling 1 bucket per minute. The port hull must have got a hole and soon the electrics were under water. As it got dark, we left the boat on the beach. Next morning some locals tried to tow it away, but failed. 3 days later, when more was broken, I declared the boat of no value and used the possibility to give it to the state, who removed it on September 11th, braking it to parts. You can find this story with more details in my German Version.